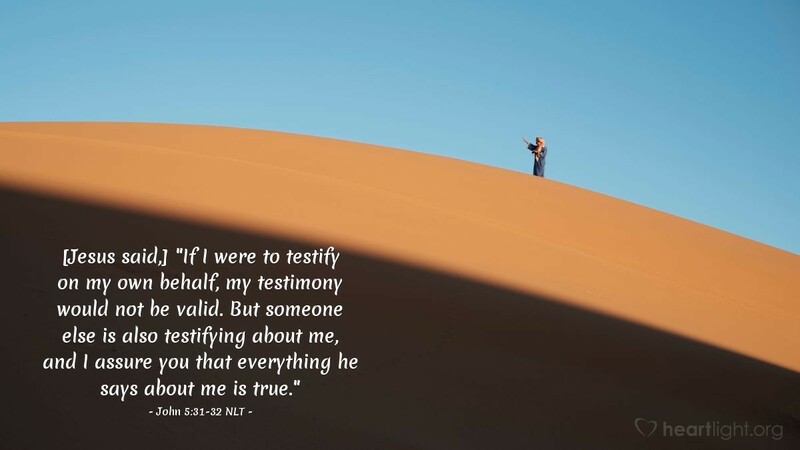 [Jesus said,] "If I were to testify on my own behalf, my testimony would not be valid. But someone else is also testifying about me, and I assure you that everything he says about me is true." Jesus didn't claim his authority as Son of God just on his own. John the Baptist will give his life to testify that Jesus is from God. Using the principles of Jewish law, Jesus will also add other witnesses — his miracles and the testimony of his own Father. What John had to say about Jesus was all true, some of it even more significant than John himself could realize. Jesus is the light of the world, the Lamb who takes away the sin of the world, and the Living One who was alive before Abraham was born. He is Jesus, the Son of God. What we do with that reality will determine our destiny! Father, I do believe you sent your Son into the world to be my Savior. Thank you for his sacrifice for my sins. Thank you, Lord Jesus, for all you did to save me. I believe that you are the Son of God, the Lord who conquered death, and my Savior who will come when the Father says the time is right. I praise you for your obedience to the Father and your redeeming love for everyone, including people like me. All praise be to you. Amen.